Do you agree or disagree with the following statement? Parents or other adult relatives should make important decisions for their older (15 to 18 year-old) teenaged children. No one knows me as well as my parents. No one wants the best for me like my parents. It is natural that I should allow my parents to make important decisions for me. I think all older teenagers (15 to 18 year-olds) should take their parents advice on decisions that concern their education, their social life, and their future careers. Toefl writing: What are some important characteristics of a co-worker? Toefl writing: How transport vehicles have changed people’s lives? Toefl writing: What are some reasons (other than money) that people work? 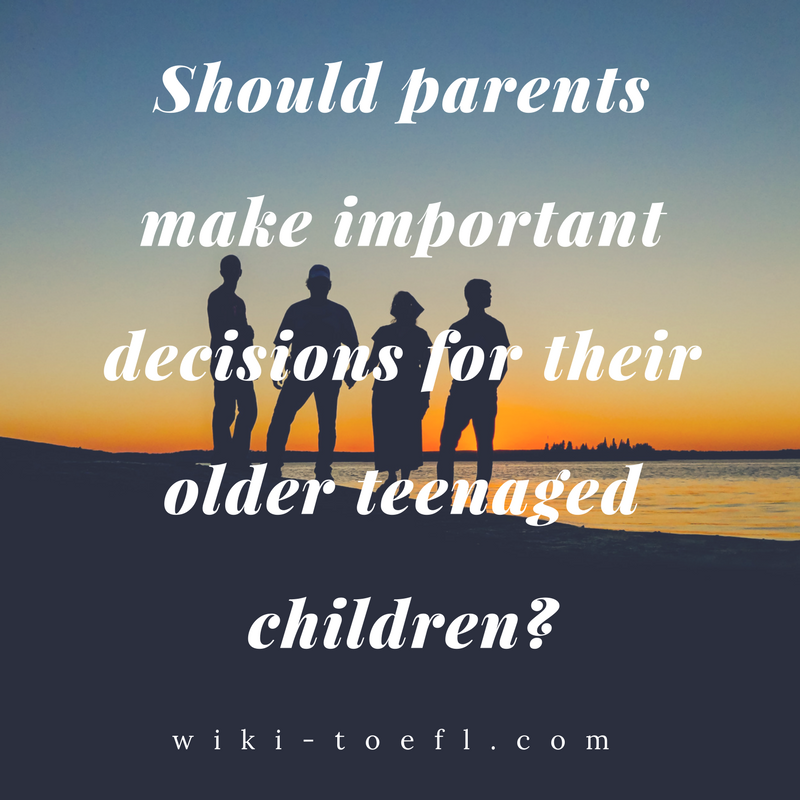 Toefl writing: What are the important qualities of a good son or daughter? Should teachers be paid according to how much their students learn? My parents have always chosen the best schools for me to attend. They have encouraged me to attend special prep classes to make sure that I was well prepared for the exams. They have given me tutors to make sure that I understood my subjects well. When it comes to choosing a college, I will trust my parents to make that decision. They know what they can afford and what will give me a good education. When I was young, my parents would invite children over to play with me. Over the years, I have become very close to these children. They are like my family. We celebrate holidays and birthdays together. We even go to the mountains together in the summer. My parents do not want me to fall into the wrong crowd. They do not want me to meet and fall in love with someone they do not know. I understand that and I want to make them happy. My father runs a very successful business and my mother is a well-known politician. They are very well connected and they have many friends who would like me to work for them when I finish school. This is a very good arrangement for me. If all children follow their parents’ wishes, they would probably be happier. Parents only want the best for their children.